Not specified in story – I made it noon. Harsh, strong desert lighting. I have used warm colours on the colour wheel (yellow & oranges) as the dominant hues used in this scene. 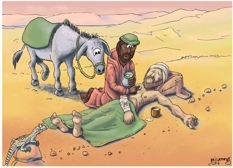 I have used the same green on the donkey’s blanket, the Samaritan’s hat & the blanket covering the victim on the road, which is a visual clue that they all belong to the Samaritan man. I have used cool blues & violets in the shadow areas to contrast with the warm colours of the harsh desert sunlight. Short shadows indicate that the sun is overhead. The Hebrew victim, the Samaritan & his donkey. 01) (Previous page) Luke 10 – Parable of the good Samaritan SET01 – Scene 03 – Good Samaritan. 02) (This page) Luke 10 – Parable of the good Samaritan SET02 – Scene 03 – Good Samaritan. The “new” (2015) drawing, which has brighter reds, oranges & yellow tones. 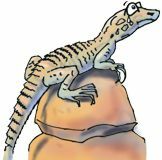 This particular scene (finished in Nov 2015) is 1 of 4 pictures for a local school. I was commissioned to produce 4 canvases that illustrate the school values: Excellence, Respect, Inclusion & Aspiration. This scene depicts Respect, based on the story of th Good Samaritan in Luke chapter 10. Apparently the canvases have been well received & are helping to enhance the Christian ethos of the school. BC blog article which shows all 4 school values canvases.